Montreal! The Marseille of the New World! Georges Marciano, fashion designer and co-founder of Guess, is credited to having compared Montreal to his French hometown of Marseille. After selling his company’s shares, he left California to live in Montreal. Not only he found a home in the Old Montreal, but created one more reason to attract visitors to this charming city in the Canadian province of Quebec. Coincidentally, my last visit to Montreal had a lot to do with his visionary creativity and passion for the arts, style, and beauty. Visiting a hotel that is more an art gallery than anything else, was another reason to be in Canada this time. Being there on a freezing weekend in December was personal, nostalgic, and romantic. 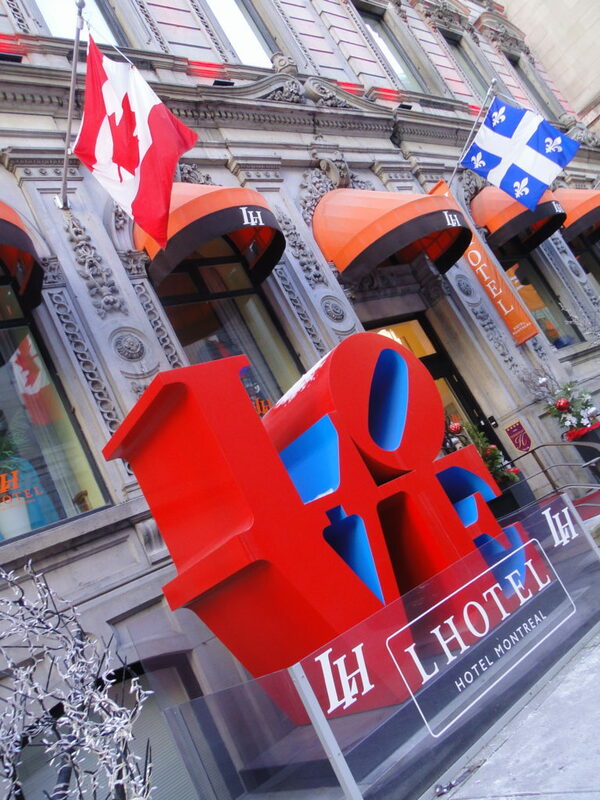 Welcome to Montreal and bienvenue to LHotel Montreal; the fabulous world that Marciano created in the historic Saint Jacques Street, the main street in Old Montreal. First opened in 1672 and the center of the financial district of Montreal in the second half of the 19th century and the first half of the 20th century, Saint Jacques Street is at the center of the city’s historic past and vibrant present. Marciano’s hotel is an art gallery where his personal art collection is on the walls in every floor in the public areas and in the guest rooms. Additionally, since my visit was just before the holidays, the Christmas tree in the lobby was stunning and displaying an elegant and exotic large figurines. 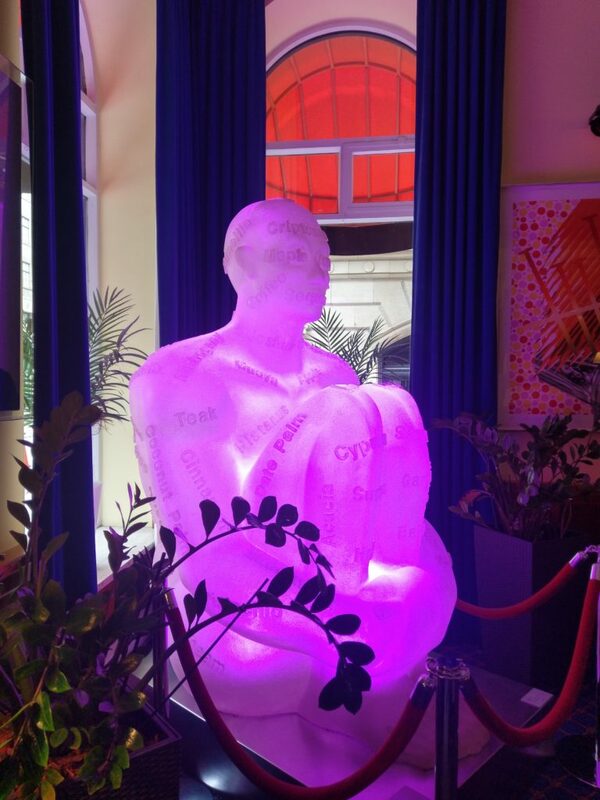 Placed outside in front of the hotel, Fernando Botero’s statue named Voluptuous Man on Horse and Robert Indiana’s Love sculpture are just the prelude to what awaits beyond the front door. 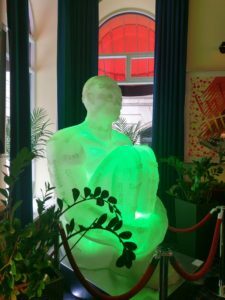 Once inside, Marciano’s portrait by Andy Warhol in the lobby of LHotel and the gigantic white resin glowing male figure by Jaume Plensa that constantly changes color, offer a glimpse of the personal, intimate character of the hotel. They are just the first of many of the surprises that lay on each corner of every floor of this magnificent boutique art hotel. At check-in guests are invited to get a cocktail or a glass of wine at the lobby’s Botero Wine Bar and walk throughout the hotel and enjoy the art collection that Marciano shares with his guests. At walking distance from the hotel, the Musee d’Art Contemporain, Musee des Beaux Arts, and the Quebec Museum of Costume and Textiles at Marche Bonsecours, are only a few to name. However, it is LHotel’s art collection of limited-edition prints, paintings, and statues that make it cozy, intimate, and unique. Marciano’s collection includes works by Andy Warhol, Jasper Johns, Robert Rauschenberg, Joan Miro, Damien Hirst, James Rosenquist, and Edward Ruscha among others. Usually, a hotel is not the primary reason to visit a city. But, this time, the only reason to be in Montreal was to visit the LHotel. A tough sell to the immigration officer who seemed to have a hard time accepting that I was traveling by myself from Vermont just to visit a hotel in Montreal. I suppose a hotel didn’t seem enough an attraction for him. Well, it was for me! After explaining why I was coming to visit this particular hotel in Montreal and delving into the bitter-sweet nature of the visit, he apologized and wished me a great weekend. It all started at the end of 2015 when I mentioned to my late husband Eric about the LHotel as he talked about unique hotels he had visited. He was passionate about hotels, which undoubtedly was the reason for his successful career in the hospitality business. As I cooked dinner, he looked it up online and as he read about the hotel he said we had to spend a weekend there. Later, as we were having dinner he told me that he had made a reservation at LHotel for us to visit Montreal in the Spring. However, the initial reservation for May of 2016 had to be cancelled as he had to visit his niece’s graduation. An attempt to go in July was scratched because of him being diagnosed with cancer, which ultimately took his life just before Thanksgiving. Just two days before passing away he reminded me that I had to go and visit the hotel. So, while I was spending some time in Vermont a few weeks after he passed away, I decided to drive up to Montreal for the weekend. It was bitter-sweet! The LHotel is everything he would have loved in a hotel. 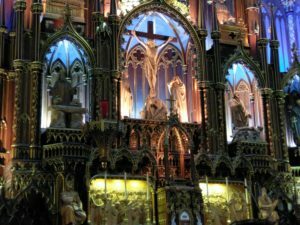 Only a couple of blocks from the hotel, the historic Basilica Notre Dame of Montreal is intertwined with the history of Montreal and its pioneers. I find it to be more impressive in its interior design and architecture than that of the Notre Dame of Paris. 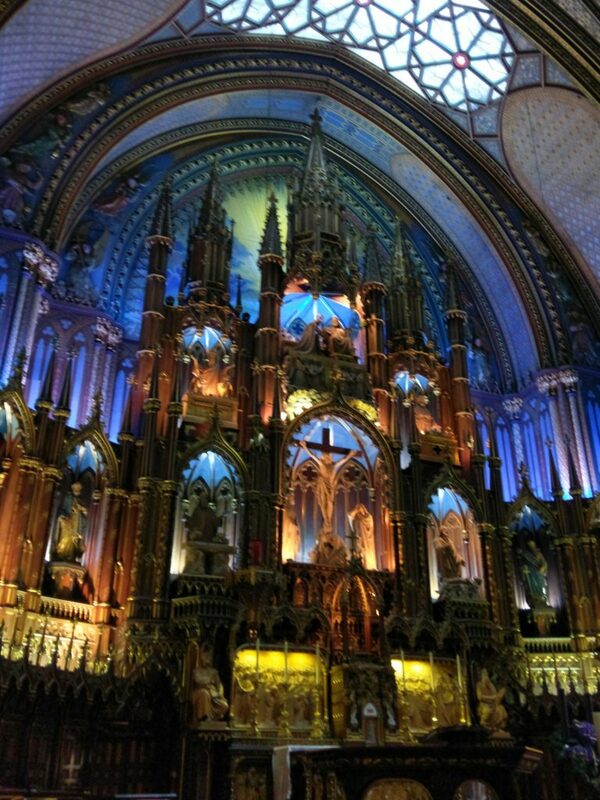 Perhaps because blue is one of my favorite colors, and there is plenty of blue that glows inside the church. The history of the construction of the church is overwhelmingly interesting and the light effect produced by its glass windows is breathtaking. Housing the largest pipe organ in the Americas, the Christmas Eve Mass is known as the greatest event of its kind and tickets to attend such celebration must be purchased well in advance. Designed by architect James O’Donnell Built in the Gothic style, the deep blue with golden stars give the vaults an incredible light effect. Multiple tones of blues, reds, purples, silver and gold adorn the sanctuary that displays stained glass windows that on a sunny day produce a spectacular show of light. 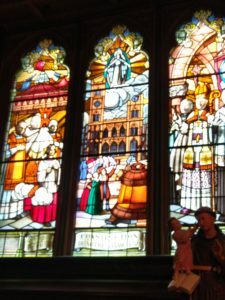 Departing from the traditional biblical scenes displayed in stained glass windows in most Catholic churches, the scenes depicted in the windows of the Notre Dame of Montreal portray scenes from the historic past of religious and founding figures of the early days of Old Montreal. Having visited Montreal at different seasons of the year, I find that no matter what time of the year the city has a unique charm. Its people is possibly the most polite I have come to know. Its cafes and restaurants are to die for and its cuisine is mouthwatering. Montreal’s several Summer festivals, the Montreal World Film Festival, Montreal Pride, and the comedy Just for Laughs Festival which is held in July each year are great reasons to visit the city. And if cold weather does not scare you away, bundle up enjoy Montreal’s laidback, romantic winter nights at some of its cozy, romantic cafes and restaurants.